“33” Export “Pen Down For Friendship” Competition. Calling on Bloggers, Vloggers, Journalists and all Content Creators, this is for you! Pen down a story about the one friend who inspires and has your back every single time for a chance to win. Publish your story in any of these media channels, Prints, Electronic or Online Blog. 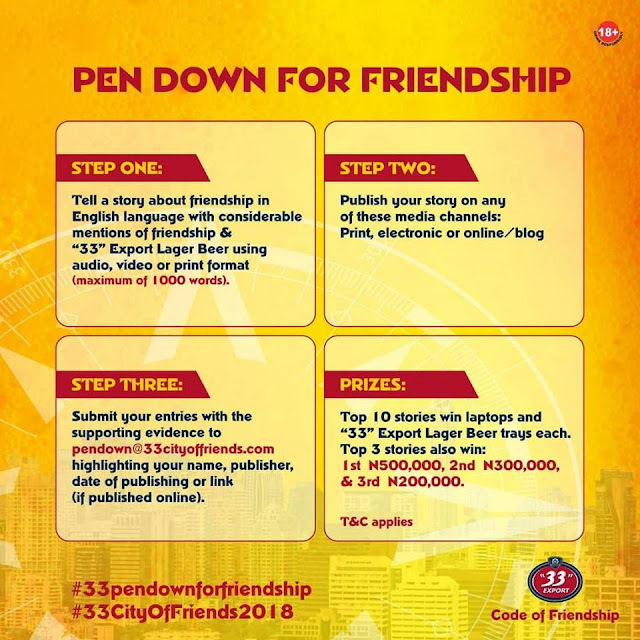 Submit your entries with the supporting evidence to pendown@33cityoffriends.com, highlighting your name, publisher, date of publishing or links (if published online). 2. Laptops and other prizes from "33" Export. All entries must be sent in between 11th of July to 27th of July, 2018. Instructions on how to participate as published on the verified “33” Export Lager Beer Instagram, Twitter and Facebook accounts form part of these Terms and Conditions. The contest is open to ONLY Nigerian Journalists and Bloggers based in Nigeria as at 12:00 a.m. on the 11th July, 2018. The competition is open to participants aged 18 years and above. Entries must be a published work in any media platform online, electronic and print. Entries should be in English with a minimum of 500 words and maximum of 1,000 words or Audio/and or Video format of not more than 2 minutes duration. All entries must be sent in between 11th of July to 27th of July. All entries MUST be received by 11:59 p.m. on the 27th July 2018. The best 10 contestants will be notified through email, phone call, and official letter on 3rd of Aug 2018 and invited to the Award/Prize Ceremony. Winners will be presented with their award/prize on Saturday August 4, 2018 at Eagle’s Club Surulere Lagos during the City of Friends Event. The reward and/or cash prize is not transferable to another individual. The best three wins: 1. Training Grants of N500, 000; N300, 000 and N200, 000 for the first, second and third respectively. 2. A Laptop Computer each. 3. Three trays of 33” Export Lager Beer. Other seven finalists wins: 1. A laptop and 3 Trays of 33” Export Lager Beer. Winners of this competition cannot participate in the “33” Export City of Friends - “THAT ONE FRIEND” Competition. NB Plc. and Partner Agencies (that is BHM, Oracle Experience, Rapid Xtra, RedStar, RDM and other associated Suppliers) staff and their relatives up to the third degree of consanguinity or affinity are not eligible to participate. Winners can have cash option of the training grant only. Winners will also get recognition to the platform where the work is being published. Where such recognition is not given, NB Plc or the Partner Agencies will not be made liable. Entries will be collated by BHM and sent to the Jury without the names of the participants so as not to be biased. Judges’ decision is final and irrevocable. The contestant does not respond within 24 hours of being contacted by the Organisers. By entering this competition, each participant hereby confirms that they hold all intellectual property rights in the work submitted for participation in this competition and that they have obtained prior written approval for the use of any third party copyrighted material contained in the submitted work. All the entries shall be considered property of “33” Export Lager Beer and may be used by the brand or her agents for publication. Without prejudice within terms, the Organisers recognises that the copyright in all works created by the Participants remain with the Participant, however it is a necessary condition of entry, and by so entering, the Participant hereby grants all necessary rights licences, approvals and authorisations to the Organisers to use such works for the promotion of “33” Export Lager Beer and for the avoidance of doubt, the Participants hereby grants the Organisers and owners of “33” Export Lager Beer Brand with a non-exclusive, worldwide, royalty free licence to use and publish such work for purposes connected solely with the competition. Where further consent is necessary from the Participant, it shall not be unreasonably withheld. The Participants will allow the submitted work to be photographed and reproduced for the purposes of promoting the competition and the “33” Export Lager Beer Brand including; catalogue, press and publicity and websites in all territories. Copyright of all works remains the property of the Participant. Any enquiries for copyright will be referred to the Participant. For the avoidance of doubt, the Participants hereby warrants that they own the copyright to the works submitted for the competition and further warrant that the work contains no feature or aspect or material that constitutes a breach (or potential/anticipatory breach) of a third party’s intellectual property. Every Participant will be accountable to any issue that may arise with regards to the originality and authenticity of the entry.